The Western world has come a long way in its drive to reduce air pollution from vehicles. Just over a decade back, the focus was on total suspended particulate matter (which includes natural dust too) and the black smoke vehicles emitted. Epidemiological evidence made governments shift the focus to respirable particles (particles smaller than 10 micron). With increasing evidence that vehicular emissions were a major health menace, these countries scaled up vehicle emission standards: Euro norms in the European Union and Tier I norms in the US. These norms reduced emissions from vehicles, but regulation kept up the demand for more stringency in the future. The automotive industry had no option but to find technological solutions -- which have moved from the engine to the tailpipe -- to make cleaner cars. The fuel industry, too, had to produce cleaner fuels, cleaning up other toxic components at the same time. (Thanks to the regulations, the task is now to go for almost sulphur-less fuel.) Yet, large regions in the US and in Europe still exceed the air quality standards for respirable particles. Responding to the scientific evidence that smaller particles do more harm, the US has also established air quality standard for smaller PM2.5. The problem, however, is that evolving science now shows that even these particles aren't the predominant kind of particles that actually swamp the air and are emitted in greater numbers by technologically sophisticated vehicles. Paradoxically, while vehicular emission norms have taken care of reduction in mass of particles, many scientists point out that the number of particles emitted by vehicles has gone up. Measured in the scale of nanometre (a billionth of a metre), these particles are called nanoparticles and almost defy geometrical definition. 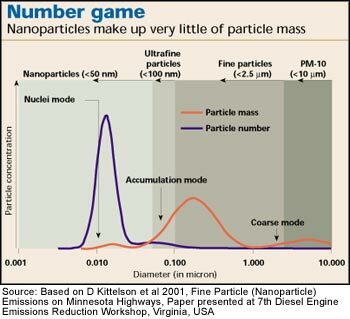 The nanoparticles comprise only 1-20 per cent of the total particulate mass emitted from a diesel vehicle, but may constitute more than 90 per of the total number of the emitted particles. What is worrying the scientific and regulatory community is that it is still not easy to measure these extremely tiny particles, with diameter less than 50 nanometre (nm), let alone control their emissions. What has improved engine technology to do with it? Improved engine technology and fuel quality has thus created a new debate. "Ironically, particle control regulations may have made the situation worse," points out Wexler, referring to increased nanoparticle emissions. Andreas Mayer, an engineering consultant based in Switzerland, does not quite agree. "Engine development does reduce the number of the larger particles but not increase the number of the smaller particles," he says. He however admits that there is a problem. "As a consequence, however, the average size of particles emitted by newer engines is smaller than the average particle size emitted by older engines. This might become a problem because if you have a mix of larger and smaller particles, the smaller tend to agglomerate with the larger ones but if there are fewer particles, but all small, they tend to stay separate which could prove a higher health risk," he says. "Technical solutions aimed at reduction of total particle emissions do not necessarily result in concomitant reductions in fine particle emissions; in certain cases, the opposite effect is observed, resulting in increased emissions of fine particles," points out Lidia Morawska of Queensland University of Technology and her co-authors in an article in the reputed journal Environmental Science and Technology. According to Daniel Greenbaum, president of the US-based Health Effects Institute, "There does appear to be a relationship between control technologies and emissions of nanoparticles." When emissions from a 1991 diesel engine was compared to that of a 1998 diesel engine in a study conducted by institute, both run on very low sulphur diesel, the new engine showed dramatic increase in nanoparticle emissions. "Although the precise reason for that is not known, one of the contributing factors is likely that the reduction in particle mass gives the nanoparticles fewer large particles to combine with, and so they remain as nanoparticles," he says. He is however optimistic about particulate traps. "The good news is that these more efficient engines, when combined with a particle filter, appear to all but eliminate the emission of nanoparticles as well as reducing the mass," he points out. "Engine technology plays a vital part. If the combustion chamber is well designed emission of the small particles is reduced," says Lennart Erlandsson of Sweden-based AVL MTC, a research and development and vehicle testing company. "Diesel fuel quality is not always important since formation of particles is more related to engine technology," he points out. According to Lennart, the recently launched petrol direct injection (GDI) engine produces a lot of particles -- sometimes even more than a diesel engine. GDI was developed in order to reduce emissions of CO2 and the engine is more similar to a diesel engine than a gasoline engine. "The best thing to reduce the small particles and also the total amount of particles is to equip the engine with a particle filter," he says. According to tests conducted by the Scientific Research Laboratory of the Ford Motor Company, catalytic converters have less than 50 per cent effect on number of particles emitted by the diesel vehicle -- usually much less -- and a negligible effect on the mean diameter of the particles. Their test results in fact shows that an overwhelming number of particles do not even come into contact with the catalyst wall. The authors also point out that measurement of the nuclei mode is not only difficult but depends significantly on the type of exhaust sampling used. Will changing the fuel help? Diesel engines have always been highest emitters of toxic particles. However, results of studies across the world on the impact of cleaner fuels and engines on nanoparticle emissions are showing mixed results. Scientists are still not clear on the role these play in nanoparticle emissions. Mayer points out, " Conventional gasoline engines emit much less nanoparticles than diesel engines when running at part load. But at full load they can emit as much or more -- particularly the older ones. Direct injection gasoline engines are as bad as diesel engines except in their homogenous operation range." Even Compressed Natural Gas (CNG) engines have been found to emit nanoparticles." Lennart, however throws a spanner of caution on CNG. "Most of the particle emissions from CNG engines are results of bad maintenance of the engine and bad lubrication oil," he says. According to K Boulouchos of the Swiss Federal Institute of Technology, Zurich, "optimised premixed combustion, particularly with CNG as fuel helps achieve particle number concentrations in the engine exhaust comparable to laboratory air quality." Maintenance of the vehicle also has a role to play. Points out Wexler, "Generally, diesel engine is worse than a gasoline engine, but it depends much on how well the vehicle is maintained." "Available evidence indicates that diesel engines are a far greater source of nanoparticle emissions than gasoline engines. Gasoline engines can emit large quantities when running rich under load. When running close to stoichiometric as they do most of the time, emissions from gasoline engines are very modest," says Roy Harrison, Professor at the University of Birmingham, UK. When the vehicle particulate emissions club (VPEC) -- a partnership between the UK government and the automotive industry -- studied on-road emissions from petrol and diesel cars, it found that though new petrol cars with three-way catalytic converters have low particle emissions, old petrol cars have high nanoparticle emissions and the emission rate increased with increase in speed. The study found that diesel cars with indirect injection had very high emissions of both ultrafine and nanoparticles, while those with direct injection were found to be high emitters of ultrafine particles. However, ultrafine and nanoparticle emissions from diesel cars were found to be much higher than petrol cars. In yet another study, the Switzerland-based University of Applied Sciences tested two-stroke and four-stroke two-wheelers for particulate emissions and found that two-stroke two-wheelers emit much more nanoparticles than the four-stroke ones. While the four-stroke engines emitted more solid particles, the two-stroke ones emitted mostly soluble particles. Even the use of a catalytic converter did not improve matters. The converter lowered the number of nanoparticles emitted from the four-stroke two-wheeler, but increased emission of solid particles slightly. Besides, it increased nanoparticle emissions in the two-stroke two-wheeler to as high as in a diesel engine, with particle size smaller than typical diesel particles (50-60 nm as compared to 90-100 nm of diesel particles). When researchers from the Queensland University of Technology tested particulate emissions from vehicles run on leaded and unleaded petrol (ULP), CNG and Liquefied Petroleum Gas (LPG) they found that converting a ULP vehicle, which are already low particulate emitters, to CNG produced no significant change in the emission of nanoparticles. However, they found a significant reduction in polycyclic aromatic hydrocarbons (PAHs) and formaldehyde emissions when the vehicle was operated on CNG, along with a reduction in its global warming potential. Similar results were found in case of dedicated LPG vehicles. A test conducted by the California Air Resources Board showed surprising results: It predictably revealed that average idle mode ultrafine total particle emissions from a CNG bus were 40-180 times lower than a diesel bus operating on ultra-low sulphur fuel. But it showed that at 55 miles per hour (mph) steady state driving, the CNG vehicle particle number emissions were 20 times higher. This did not change even when an oxidation catalyst was added to the CNG vehicle. The researchers however point out that they have not been able to identify the source of these particles. They speculate that lube oil composition and its consumption had a role to play in this. According to researchers, similar emission levels of nanoparticles seen for same type of engine running on different fuels (ULP, CNG and LPG) indicate that the fuel type does not play a crucial role in nanoparticle formation, as long as the engine is properly tuned. They opine other factors like vehicle management system and the consumption of lubricating oil could play major roles in the particulate formation mechanisms. Thus the majority of the formed particles are either volatiles formed during the dilution process or solid ash particles from the combustion of lubricating oils, they say. 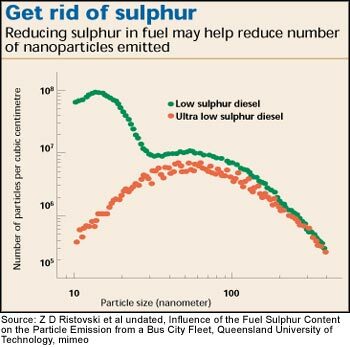 According to Mridul Gautam of West Virginia University, USA, reducing fuel sulphur levels alone may not be an answer to reducing nanoparticle concentrations in diesel exhaust emissions. Lube oil sulphur levels and additive packages too greatly influence size distributions and concentrations of particulate emissions, he says. He also points out that nanoparticles are generated as a result of highly complex interactions between fuel and lube oil hydrocarbon chemistry and sulphur content, engine operating modes, the exhaust dilution system itself (in addition to dilution conditions). Research on nanoparticle emissions from vehicles is still in the academic domain. This is largely because the uncertainty over formation of nanoparticles and their measurement methods. As a spillover, regulatory mechanisms are not yet able to take into account this new science. They still use mass of emitted particles -- rather than numbers -- as a yardstick to measure pollution . According to Wexler, the reason why regulations are based on mass of particles is because scientists measured these, did epidemiological studies and found a correlation with adverse health effects. Lennart points out that "so far there is no standard for measurement of nanoparticles and different laboratories uses different methods of sampling. It is therefore hard to compare the result between laboratories, but easier to compare different test at the same laboratory." According to Kittelson, the fact that more than 90 per cent of these particles form during exhaust dilution and that semi-volatile particles may change in orders of magnitude during sampling and dilution makes their measurement difficult. He also points that it is very difficult to design a sampling and dilution method that simulates atmospheric dilution. Moreover, since emission conditions are highly variable in real-world conditions, it is difficult to link the on-road emissions with the corresponding ambient concentrations in a simple way, say scientists from Paul Scherrer Institut, Switzerland and University of Minnesota, USA. Even the other aerosols in the ambient air can have a great effect on the nucleation and growth processes of the exhaust complicating the issue further, they say. According to Greenbaum, one of the big controversies in measuring nanaoparticles is how to account for the part of nanoparticles that are not made up of solid carbon or sulphates, but rather consist of aerosol droplets formed around hydrocarbons. These are potentially harmful, but some measurement techniques (using a thermal denuder) burn them off before measuring the number of particles. One way scientists simulate formation of nanoparticles is by using dilution tunnels. Different types of dilution tunnel are used to investigate nanoparticle emissions and there is some uncertainty as to how the difference in these tunnels may affect results, and how closely the tunnels represent ambient dilution. According to Tristan Davenne of the University of Cambridge, "There are a number of dilution parameters which vary from one dilution tunnel to another and may be responsible for transforming the particle size distribution measured after dilution," he says. Points out Mayer, "Engine development as we see it now as well as fuel development are by no means sufficient to reduce emission of the nanoparticles." According to him regulation of particle mass is not sufficient for three reasons: (1) reducing particle mass means reducing large particles; nanoparticles have hardly any measurable mass, (2) sensitivity of mass measurement methods is not sufficient to reduce limit values to levels required to clean engines of nanoparticles, and (3) the mass could be just water on slightly acidic condensates or it could also be PAH and solid nanoparticles. Therefore, for management and control of fine particle emissions, particle number or particle mass in the ultrafine range should be used as an indicator, conclude a group of scientists from Centre for Medical and Health Physics in Queensland University of Technology. Yet, an immediate prospect of setting emission standards or regulating emissions of nanoparticles seems bleak. Says Wexler, "I would say that things are in the research phase right now, and regulations are still in the future." But Harrison has a different point of view. According to him though the measurement technology is well developed, at the moment the available epidemiology is extremely limited and standards could not be set with a high degree of confidence. Recent scientific studies have thrown up a highly interesting and relevant debate regarding monitoring of ambient particles. It is being argued that measurement of particulates in terms of mass only does not bring out the risk from exposure to the number of extremely tiny particles. 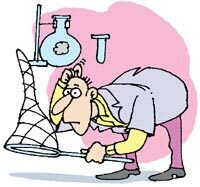 Therefore what is more important is to monitor the number of particles in different size categories. A recent joint report by Lidia Morawska of the Centre for Medical and Health Physics at Queensland University of Technology, and Dietrich Schwela of World Health Organisation says that most of the mass of particles in the ambient air is due to the presence of a very small number of large particles. But, when considered in terms of number, ultrafine particles constitute over 80 per cent of particulate matter, although their total mass is usually insignificant in comparison with the mass of few large particles. The report argues that the highest level of concentration of toxic compounds is related to these ultrafine particles, and therefore throws up the question that whether physical, chemical and biological characteristics should also be measured in addition to numbers. In a study conducted to find out the particle number concentration in urban environment, researchers from the National Environment Research Institute, Denmark measured particles with a range of diameter from 10nm to 700nm. They found that the average traffic particle emissions between 6 am and 6 pm showed a size distribution with the maximum around 25-30nm. According to the researchers, this indicates that petrol and diesel vehicles emit particles in a similar size range. However, they found that from 12 pm to 5 am, when the dominating traffic was that of diesel taxis equipped with an oxidising catalytic converter, the maximum in the emitted particle size distribution was shifted to smaller sizes of about 15-18nm. While scientists are trying to grapple the import of the new findings, results of another study by the University of Birmingham in 1999 implicate road transport for emitting such ultrafine particle emissions. The study shows that at busy roadside, more than 44 per cent of the measured particles are below 10nm, while the corresponding figure at an urban background can be 30 per cent. This has led researchers to demand that number of particles in the ambient air be used as a yardstick to evaluate air quality. At present, air quality standards of all countries in the world measure the concentration of particles only in terms of mass. In sum, the regulatory mechanism is still not prepared to build on the emerging science of nanoparticle emissions. Even as it continues to set more and more stringent norms -- both for emissions and ambient air quality -- it now faces an unexpected challenge. Once more the emergent knowledge on nanoparticles, still somewhat nebulous but decidedly indicative, demands the scientific community and the regulatory authorities to put their heads and capacities together. Of primary concern is the fact that finer particles penetrate more readily into cells and through tissue barriers, that they have greater surface area per unit mass and a large number of toxic reactions occur at the surface. Years of research have validated the adverse effects of fine and ultrafine particles. Yet not much definitive information is available on how nanoparticles affect human health. Greenbaum points out, "To date, there is evidence that nanoparticles can cause adverse reactions in animals and humans, but epidemiology studies have not yet determined whether those reactions are worse than those caused by other parts of the particle mixture." Wexler, however, is of the opinion that conclusions about adverse health effects of nanoparticles is more of a logical than direct: the minuter the particle, the greater its propensity to adversely affect health. Hence PM1 would shows a better correlation with adverse health than PM2.5, which in turn shows a better correlation than PM10. "As you move towards smaller particles, their number is substantial," he says. Therefore, they can be critical to public health, he says. However, a recent study presents scary results. Researchers from the US-based West Virginia University found that though the use of synthetic diesel decreased PM mass emission rates, it increased the number of particles deposited in the alveolar region. Moreover, even as the use of oxidation catalytic converter and catalysed particulate trap decreased particle mass emissions and subsequently reduced mass deposition deep inside the lungs, the number of particles deposited in the alveoli -- the lung's breathting sacs -- increased. Their natural suggestion was to do count-based analysis of PM emissions in addition to mass-based emissions. Though earlier studies have shown that macrophages -- cells that police the lungs, eating up foriegn particles -- ingest the inhaled particles, new studies show that the smallest particles partially escape detection by the much larger macrophages and are not ingested. According to L Hofer, a Switzerland-based occupational health specialist, respiratory pulsation, by which the alveoli dilate and contract, expels some of the particles into the bronchiole, possibly after prolonged retention in the alveoli. He points out that these particles could also penetrate, through the narrow interalveolar pores, into the pulmonary interstices (the interstitium). There the lymphatic fluids can capture and transport the particles to the regional lymph nodes. As these particles do not decompose easily, they are retained for several weeks, months or years in the interstitium and in the lymph nodes. Such particle accumulations are mutational and tumor inducing, he says. The particles are also partially dissolved and transported to various organs. Prolonged high concentrations of particles in the respiratory air cause alveolar overload, that is, the particle invasion overwhelms the scavenging mechanisms of the body. The decomposing macrophages then release inflammatory substances that can damage the alveolar walls. SSP was originally and primarily an irrigation and hydropower project. Today there is a shift in focus: one talks only of drinking water -- a very small part of the original plans for which there was no budget at all. Many feel that the decision to focus on providing drinking water in a time of visible droughts was an obvious attempt to justify the project. While there is no disputing the real need for water in Gujarat, a number of unresolved issues remain, leading to more complications than what meets the eye. For one, says Sudarshan Iyengar of Gujarat Institute of Development Research (GIDR), "the basis on which calculations for providing drinking water were made have altered over the years, leading to a source of potential conflict". The target now is to cover 8215 villages, 135 towns and 3 municipal corporations in Saurashtra, Kutch and North Gujarat. At the planning stage, a number of factors were taken into account: the existing drinking water supply situation, the actual requirement, the shortage and population growth. Since then the water crises has deepened. Many more villages have become "no-source" ones or have been added to the list of the salinity- or fluoride-affected. It is also alleged that the number of villages that were to receive the water has increased over the years without an increase in the amount of water allocated. "Since urban areas are concentrated pockets of vote banks, they are more aware and vocal. They will be better equipped to negotiate a better deal than rural settlements can ever hope to," is Iyengar's worry. Mere creation of drinking water supply sources will not ensure water to households. What gets ignored in the euphoria of the pipelines reaching Kutch is the real task of delivering water at the micro-level. How sustainable is the system of delivery? What about recovery of costs? How will conflicts between villages, or even within villages be resolved? 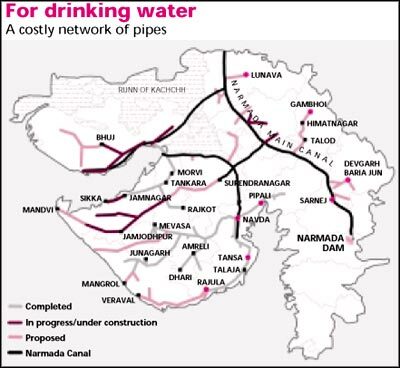 The Gujarat Groundwater Supply and Sewerage Board (GWSSB) has created an elaborate network of pipes to supply drinking water from SSP, over the last six years (see map: For drinking water) at an approximate cost of Rs 7,230 crore. These pipelines are typically centralised, supply-driven systems. They leave the intended beneficiaries out of the process and are very costly. Over the years, views about such large bureaucracy administered top-down systems -- with low cost-recovery and poor reliability of water supply -- have been changing. "They cannot even manage the initial area let alone spread to new areas," says Apoorva Oza of Aga Khan Rural Support Programme, a local non-governmental organisation (NGO). There is growing acceptance that operation and maintenance (O&M) of water supply installations should be done by local bodies. There is even a government resolution on formation of village pani samitis. "This idea has however not moved from the rhetoric to implementation" says Oza. A case in point is the Ghogha project in Bhavnagar district -- a pilot project in community management of drinking water. Here the Centre for Environmental Education (CEE) and other NGOs were entrusted with the responsibility of educating villagers into forming pani samitis and collecting costs for O&M. While the NGOs have done their work, the in-village distribution system is nowhere ready. Corruption is rampant: dishonest contractors use poor material and sometimes pipelines run around the village instead of taking a simpler route. According to P M Bohil, sarpanch of Awanaja village, "We have already paid the advance bill sent to us, but because 20 per cent of the work is incomplete, we are still waiting for water." He spoke of neighbouring villagers breaking into pipelines, since they too have no water yet. The pipes have air-valves to release pressure which can be tampered with easily. The GWSSB is plagued by daily complaints of breakages in pipes. "It takes three to four days to fill the pipes and there are periods of maintenance," explains Nanak Santdasani, executive engineer at the board. "People get impatient and break the pipes. Again if there is no electricity and less pressure, those at the tail-end of the pipeline are sure to tamper with the pipes to get water." He feels that a change in people's mindsets and giving them a real sense of ownership over resources would help in improving conditions. "Since there is always an election at some level or the other, politicians cannot take harsh decisions," pronounces J Vasawada, member secretary, GWSSB, pointing to the lack of political will to charge for water. Currently it is Rs 14 per capita per year in rural areas. The cost of transporting water over such vast distances is, at best, staggering. He says the electricity cost alone to GWSSB of pumping this water into the system is Rs 10 crore per month. The proposed revised charges are Rs 2 per 1000 litres in rural areas, Rs 5 for town municipalities, Rs 6 for municipal corporations and Rs 15 for industry. While surveys indicate that people are willing to pay for reliable water supply, politicians are hesitant to impose fees. The board feels its hands are tied: if it were to stop water supply for non-payment, political pressure would force them to relent. The rules are different everywhere: while villagers in Bhavnagar get advance bills even before the infrastructure is complete, in Jasdan taluka and Bhesan they have been getting regular water supplies over the last 6-8 months free of charge. "Water, once received free, will come to be considered a right," is an oft-quoted warning. North Gujarat is notorious for its heavy dependence on groundwater. Water tables have dropped to such levels, that in places what is extracted is fossilised water. Flourosis affects an increasing number of villages in the area. In spite of this, the recent move to use Narmada water to recharge the groundwater is fraught with the suspicion that since infrastructure in the CA is inadequate, the authorities don't know what to do with all the water they have. M S Patel, Secretary of the Narmada Water Resources and Water Supply Department (NWRWSD) has a different explanation. "It is an investment for the future," he says. "Since the network will not be ready for another 5-10 years, we can use this water to fill waterbodies and recharge aquifers to get a jump start, where groundwater levels can be brought up," he adds. M K Makwana, of the Drainage Circle of the department, spoke of a Rs 2,500 crore plan for pumping 1 MAF of water up to North Gujarat. The region is not a part of the CA. Currently, a Rs 178 crore scheme is in progress -- a 100 km long pipeline from the main canal will lift water to Dharoi dam. Three pumping stations along the way with a lake at each site will lift the water up the 100-metre gradient. Water will be used to fill tanks, ponds and recharge tubewells along the way. North Gujarat uses 42 per cent of Gujarat's electricity, mostly at subsidised rates. The idea behind this is that the expenditure on electricity to pump water from the tubewells will be greatly reduced. Since water is to be pumped to a greater height, Makwana believes that it will also flow down, filling ponds and other waterbodies on the way, which are naturally connected through local canals, the drainage system and catchment areas of streams etc. "Over 12,500 tanks (ranging from village ponds to minor irrigation schemes) have been desilted and about 1000 new tanks constructed," he says. Twelve or thirteen such pipelines have been proposed to lift water towards the 9 dams of the area -- not to fill them but to use the existing canal network to distribute the water. This water is incidentally only to be used for recharge, and not irrigation or other purposes. Dinesh Kumar of IWMI expressed grave reservations about the plan. "Government work is all about civil engineering -- hydraulics is not taken into account," he says. At a technical level there are issues regarding how successfully recharge will actually happen. " It will only create recharge at the shallow aquifers, they need recharge tubewells sunk into the ponds to take water down to lower levels," is his contention. Makwana reckoned that the cost of lifting water "would still be cheaper than the money the government spends on subsidising electricity for pumping groundwater in the region". There is as yet no tariff system in the government's plans for this water. And, for all the talk of people's participation, there is no clear thinking on how the recharge ponds would be maintained or desilted in the future. Who would manage these local water bodies, who would play a role in conflict resolution? Who would ensure that the water brought in would not beget further extraction, just when awareness about the gravity of the situation was spreading in North Gujarat? These questions only elicit silence from the authorities. Shah points that the behaviour and practices that took root during the initial years of the project will not only be difficult to change, they will also influence the practices in the coming years. It is for this that the utmost care should be taken in the implementation of the project. The project has aroused enormous expectations, gobbled much public money -- now the politicians have taken over and they are well on their way to dash people's hopes.